Stadium comes first, and then comes the team. Built in 1959, Stadio San Paolo has turned into a legendary battlefield hosting S.S.C. Napoli. The stadium depicts the club’s glorious history and is the home of 60,240 of its dedicated supporters. S.S.C. Napoli is proud of having Stadio San Paolo as their home ground since 1959. That’s exactly when the venue was built under the name Stadio del Sole. What’s truly incredible is that originally the ground’s capacity was ‎109,824. After a number of renovations its capacity naturally decreased but it’s still the country’s third largest stadium despite its age. Only San Siro and Stadio Olimpico can house more fans in Italy. Like the majority of European grounds, Stadio San Paolo was built in a ‘bowl’ style. It has got two tiers and a metal roof covering all of the seats. The Curva Nord is the northern stand. The craziest ultras of Partenopei cheer for their team from that stand. The Curva Sud is obviously the southern stand and the away supporters enjoy the games sitting there. All executive facilities, the press area, and dugouts are located at the Western Stand (Tribuna Posillipo). Thus, it is the stadium’s Main Stand. There is not much to say about the Eastern Stand (Tribuna Nisida). The seats there are not any worse than the Main Stand’s seats so you can choose them without hesitations and usually save a few euros. Curve – the seats located behind the goals. Stadio San Paolo hosted quite a few matches featuring Italy national football team. It also had the honour to host five 1990 FIFA World Cup’s matches, including the legendary semi-final between Argentina and Italy, when Diego Maradona scored the winning goal in the penalty shoot-outs. The most convenient and timesaving solution whenever you want to buy tickets to the match played at Stadio San Paolo is StubHub. I especially can recommend it to those who are going to Italy from abroad. This service gives the opportunity to purchase tickets at any moment – both when they are sold out and when the available options are not the ones that you want. The prices are higher than if you buy tickets directly but they are usually quite reasonable. Ticket office located right at the stadium. Some football clubs have clear ticket pricing policy which can be applied to any match of the competition, while the others set prices unpredictably. “The Little Donkeys” belong to the second group and you can never tell in advance how much would they charge even for the ordinary match against Chievo Verona. There are only two factors which are clear. Firstly, the seats behind the goals are the cheapest. Secondly, the prices usually range from €20 to €120. A popular phrase you can hear in Italy sounds like “Vedi Napoli, e poi muori”. It means that you must see the beauty of Naples before you die. While there are numerous causes to visit Naples, Booking.com will help you to find accommodations regardless of your reasons for visiting this magnificent city. Below you’ll find some of the nicest hotel options I’ve put together for the football fans coming to Naples. Hotel Primavera – this place features nice rooms with balconies and city views. They charge £38 per night and have some very affordable breakfasts. The distance to Stadio San Paolo is less than one mile. Best Western JFK Hotel – offers excellent air-conditioned rooms with free Wi-Fi and many other comfortable features. They have an airport shuttle and a convenient transport hub nearby. The distance to Napoli’s football ground is also less than a mile. Hotel Leopardi – is an enjoyable and clean hotel with a marvellous roof garden. The price starts at £49 per night. It is located approximately a 10-minute walk from Stadio San Paolo. Hotel Cristina – provides modern accommodations of the highest quality. It boasts an excellent location as well. You’ll have a number of transport options right next to this hotel and a 1-mile distance from the city’s main sports ground. Palazzo Esedra – is a lovely boutique style hotel with reasonable prices starting at £61 per night. Many football fans are crazy about staying right next to the stadium. This hotel provides such opportunity in the best way. BW Signature Collection Hotel Paradiso – if you want to spend time like a king in Naples, choose this waterfront hotel. Of course, it’s pricier but £119 per night seems to be reasonable for the venue of such a high level. The distance from this hotel to Stadio San Paolo is about two miles. The traffic in Naples is crazy, especially during the important football fixtures. Therefore, the car is not the most convenient way of transportation. Luckily, you can use the metro, trains, and buses which are affordable and predictable. The distance from the city centre to the ground is about 5 miles. It is situated in Fuorigrotta, the western suburb of Naples. By Tube and Train – line 2 of the metro of Naples links the city centre with the stadium. It takes about 30 minutes to get from Piazza Garibaldi to Stadio San Paolo via metro. Get off at Piazza Leopardi and walk for less than 10 minutes. The train station called Napoli Campi Flegrei is situated even closer to the ground. It also connects the city centre with its main football venue. By Bus – the bus lines 151 and 152 are the most convenient for those who are heading towards the stadium from the centre of Naples. 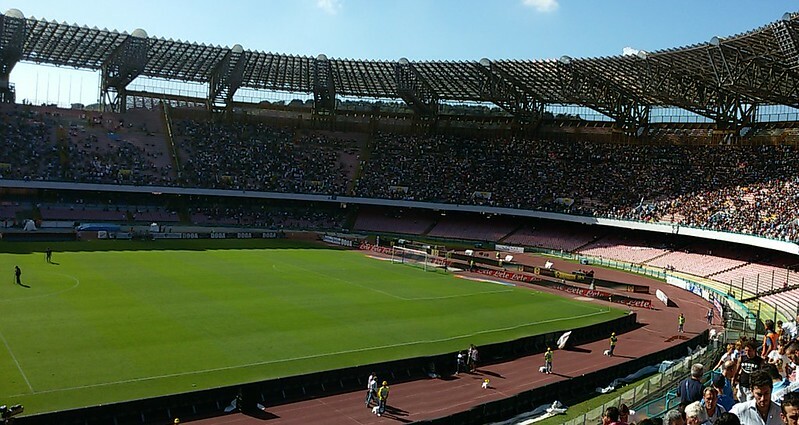 By Car – if you decided to arrive at the stadium by car despite all obstacles, Stadio San Paolo’s address is Pizzale Vincenzo Tecchio. By Plane – although Naples International Airport is only 8 miles away from Stadio San Paolo, the ride on public transport within this route takes not less than one hour. Use the bus line 180 for the quickest result. The stadium has no specific parking available for the fans. Also, you need to be aware that the traffic in Naples on matchdays is quite crazy and parking spaces are limited. However, there is always a solution. The approximate matchday paid parking price near the sports venue in Naples is €5-7. Naples is famous for its pizza, of course. It’s probably the best destination to discover the real Italian cuisine and try the delicious, fresh, and cheap pizza, often for less than €10. If you prefer something different, you should know that the Neapolitans are obsessed with food. The number of traditional dishes they have is incredible. Each person will find something amazing in the local cuisine. Among the must-try dishes are pasta alla Genovese, spaghetti alle Vongole, friarelli, and tons of unique pastries such as sfogliatelle. Guest House Pub – can be found a few steps south-east of Stadio San Paolo. On a matchday, it’s recommended to reserve a table in advance because it can get very crowded. The quality-price ratio won’t disappoint you. Frank Malone Pub – is located about 4 miles away from Stadio San Paolo. Of course, it’s not the closest pub to the ground. But it’s definitely a great one and it’s located right in the city’s centre. They have many TVs broadcasting live sports events and a great menu. Bar Nilo – it will take you about 40 minutes on the metro to get from the stadium to this fantastic bar. Anyway, it’s located in the historical centre of Naples so you won’t miss it. The bar is dedicated to Diego Armando Maradona, so it’s definitely worth visiting. Caffeteria degli Azzurri – is a place where you can eat, drink, and hang out with the local fans. This nice spot can be easily found right next to Stadio San Paolo. They have a wonderful bar, lots of desserts and great prices. O Murzillo – is a bright example of the affordable fast food restaurant which is doing it the right way. Naples has many great places to eat like this one but O Murzillo is located just near the football ground and thus is very convenient for every fan travelling to Naples. Flego – is a restaurant located around a 5-minute walk away from the Azzurri’s stadium. They quickly serve authentic Italian dishes but there are not many tables inside. It’s an ideal restaurant to order an affordable and very tasty takeaway on your way to the football spectacle. Stadio San Paolo boasts with a rich history and has some legendary stories to tell. For a real fan of Azzurri, probably nothing can compare with the matchday experience when thousands of Napoli’s fans create the inimitable atmosphere of the football fest. A number of vendors set their stalls with merchandise of Partenopei before the matches. So if you arrive at the stadium a bit early, you can spend some time window shopping or buy a memorable souvenir with Napoli’s crest. Although football fans love stadium tours, unfortunately, there is no such thing at Stadio San Paolo. The ground itself is located in the residential area and sincerely there is not much to see inside the stadium and around it. If you are looking for the best souvenirs related to Napoli, you should certainly visit one of the club’s official fan stores. They sell literally everything you can imagine that is connected with this glorious Italian football club. The address of the first store is Piazza Giuseppe Garibaldi, 3. It’s located six miles away from the stadium. The newer store can be found at Via Chiaia, 161 and is called Macron Napoli Fan Shop. The distance to the stadium is four miles. Both fan shops are located in the centre of Naples. If you want to buy an awesome gift for the Partenopei supporter but you are currently not in Naples and not even in Italy, I suggest you visit Napoli’s online fan store. If you want to see authentic Italy without crowds of tourists and over glamorous spots at every corner, you should definitely come to Naples. Some people say this city is the soul of Italy and that can be true as well. And although some people may not like lack of shine and the presence of some dirt in Naples, the city definitely has a unique atmosphere and it is home to quite a few amazing attractions. Among them are fine museums, numerous historic churches, incredible ancient castles, and ruins. If you are a fan of hop-on-hop-off tours, in Naples it really covers main attractions giving you a chance to get acquainted with the city quickly and efficiently. The tour normally costs just about €20 per 24 hours and it’s definitely a no-brainer. There are three lines and 33 stops where you can hop-off and hop-on as many times as you need again and again. Galleria Borbonica – this unique place of interest is a lucky find for nearly any tourist. The secret underground part of Naples is full of mysterious riddles and historical puzzles. The place used to be full of garbage just a few years ago. Now the route is clean and it completes the right atmosphere of such a one-of-a-kind historical attraction. Via San Gregorio Armeno – this street is known for some of the most unique Christmas presents but it actually welcomes the visitors all year round. It’s a shopper’s paradise selling thousands of hand-made artistic masterpieces, tons of clothes from boutiques and vintage shops. Teatro di San Carlo – surprisingly, the world’s oldest working opera house can be found in Naples. This fact alone persuades many people to add it to their must-see list. However, it’s not only old but also magnificent in terms of its architecture, details of the interior, and overall atmosphere.